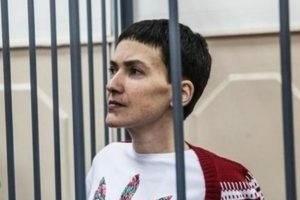 Nadia Savchenko, Ukraine’s MP and former Air Force pilot, has caused controversy with a suggestion that Ukraine should give up the Crimea in exchange for Russia leaving the Donbass region. On Tuesday, Savchenko stressed that the situation in the east of Ukraine can only be resolved peacefully. “Whatever my fellow MPs are saying, we will have to refuse from keeping Crimea. It can be viewed as the non-recognized occupied territory, like that of Transnistria. In order to prevent Donbas from becoming another Transnistria in Ukraine, we’ll have to leave Crimea occupied, and then it will be possible to release Donbass. I don’t see that happening any other way”. – said Savchenko on January 17, during her interview with 112 Ukraine TV channel. According to the former pilot and prisoner of war, if Ukraine somehow returns Crimea to Ukraine, Russia will formally annex territory in the Donbass. Savchenkos’ suggestion caused harsh criticism from politicians and Ukrainian society. “We will not exchange Crimea for the Donbass, and we will not give up the Donbass either. We will claw back every meter of Ukrainian land,” said Iryna Herashchenko, first deputy speaker of Ukraine’s parliament. “I never said one should give up on Crimea. It is already lost. I don’t want people to be misinformed: those telling you it is still ours…they lost it back in 2014,” she said. “Russia does not discuss the status and future position of Russian regions,” Dmitry Peskov said to Ria Novosti. Savchenko went from national hero to one of the main targets of criticism from the pro-government politicians. She fell into dispute with Ukraine’s ruling circle after her trips to the self-proclaimed unrecognized Donetsk and Lugansk republics. Her actions and commentary has received criticism since then. She is already excluded from the delegation of Verkhovna Rada and now authorities are excluding her from the parliamentary Committee On National Security And Defense.